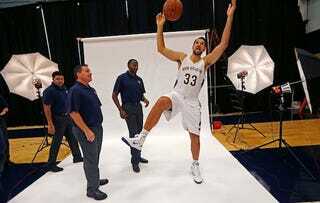 Pelicans forward Ryan Anderson is a movie buff. So before a preseason game in Atlanta last week, I presented him with a Sweet 16 bracket of the best basketball movies ever made (seeded based on Rotten Tomatoes and IMDB ratings), and asked him to pick the winners. On Space Jam: "Number one, Bill Murray's in it. Forget about Michael Jordan for a second." On Blue Chips: "I love any movies with Shaq cameos, except the ones with Adam Sandler." On Kevin Durant's acting skills in Thunderstruck: "It's not really a classic, let's just say that." On why he made the executive decision to write in Eddie, which wasn't initially in the bracket: "It's one of my favorites of all time." "What would I want to watch right now? I would want to watch White Men Can't Jump." On Hoop Dreams: "Too depressing." On why he had White Men Can't Jump go all the way to the final: "Me being a white man that can't jump, it just makes sense to me." On why Space Jam wins the bracket: "At the end of the day, they're trying to fight for the greater good. They're fighting for humanity." Jacob Eisenberg is a senior at Emory University in Atlanta, Ga., and specializes in NBA analytics. Follow him on Twitter @eisenberg43 and check out his website at jacobeisenberg.com.